This Halloween, try these cocktails that promise to raise spirits. Courtesy of Jacopo Falleni, mixologist and owner of Café Firenze and Firenze Osteria, Hollywood. In a cocktail shaker with ice, combine Tequila, pear nectar and sweet and sour mix. Next, add Schnapps and the juice of a lime wedge. Drop the lime into the shaker and shake until well combined. Mix cinnamon and sugar on a small plate. Coat the martini glass rim with simple syrup, then dip the rim in the mixture. Spray the martini glass with pumpkin spice edible perfume. 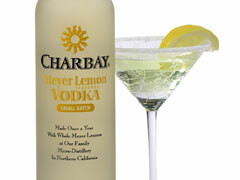 Pour the ingredients of the shaker into the martini glass and serve. Courtesy of Anvil Bar & Refuge, Houston, TX. Combine all ingredients, except the orange slice and mint sprig, in a cocktail shaker with ice and shake well. Strain into a cocktail glass and garnish with an orange slice and mint sprig. Courtesy of Drago Centro, Los Angeles, CA. Combine all of the ingredients except the Nocello candy in a cocktail shaker and shake well. Strain into an Old-Fashioned glass with ice. Garnish with the Nocello candy. Combine the Nocello and sugar in a medium saucepan and bring to a boil over over medium-heat. Once it’s boiling, pour the liquid onto parchment paper to cool. Once cooled and hardened, break up the candy into small pieces. Courtesy of Raul Yrastorza of Las Perlas, Los Angeles, CA. Muddle the apple slices in a mixing glass. Shake all of the ingredients together with ice and double strain in a cocktail glass over ice. Top with a drizzle of blackstrap molasses. In a medium saucepan, combine cream with pumpkin syrup, sugar, vanilla and spices. Divide the brewed coffee between two mugs and split the tequila and cream mixture equally between each mug. Top with whipped cream and cinnamon. Serves 2. Mix vodka, sparkling wine, lemon-lime soda and orange juice in a large punch bowl. Scoop the sherbet into the punch bowl, allowing it to melt slightly to produce a film over the top. Add sugar to taste. Float the peeled grapes in the punch. Serves 15. Courtesy of Sanctuaria, St. Louis, MO. Combine all of the ingredients in a cocktail shaker filled with ice and stir for 30 seconds. Strain into a chilled cocktail glass.